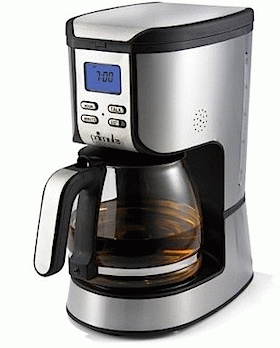 This coffee maker takes coffee drinkers to a new level. Hammacher Schlemmer offers the first voice-interactive coffee maker that asks, "Would you like to set the clock or set the coffee brewing time?" and operates in response to your verbal commands.If you are feeling lazy to make a coffee, this Voice Interactive Coffee Machine could pass for a maid or servant that will whip up your daily brew according to your wishes. Simply saying, "Set the coffee brewing time," or "Set the clock," will prompt the machine to reply, "Please say the time, including AM or PM." It uses an advanced voice recognition system to identify any time of day you speak, eliminating the hassle of fussing with buttons. The included reusable, dishwasher-safe plastic filter is specially designed to allow the water to thoroughly saturate coffee grounds, maximizing the richness and aroma of coffee.